Re-imagined childhood memories in my hometown with the particular attention to the social conflict and pop cultures that were influenced by China’s tremendous development. My childhood memory is blurry and mysterious because many details are gone with time. Beijing is my hometown, but sometimes I feel it’s slowly becoming a different city. Whenever my mom had to travel to other places, she always liked to bring me with her. I had a great opportunity to see the world with my own eyes. However, as an introverted person, books and films became my best friends when I was young. I built an imagined world around myself, and those Chinese pop culture made my childhood colorful. No matter where I am, Beijing still has a special place in my heart. The speed of the development in China is really fast. 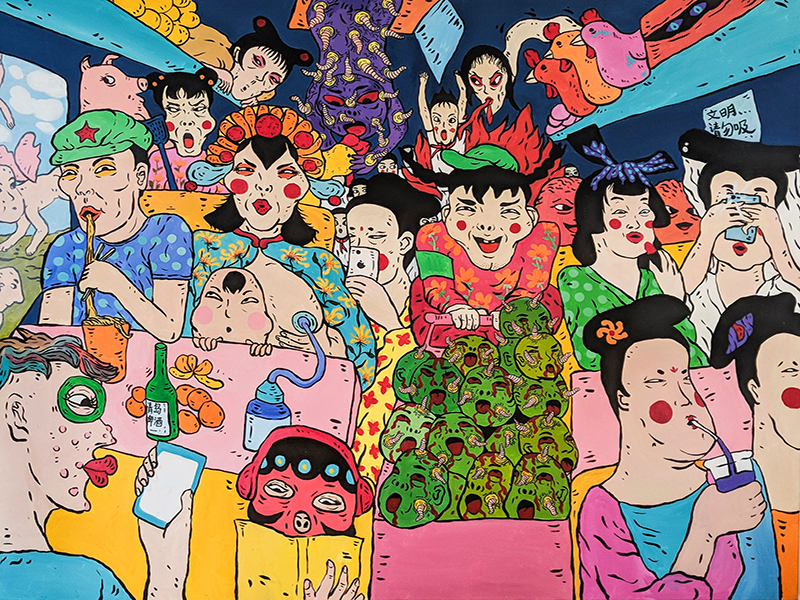 In my artwork, I have explored my childhood memories with the particular attention to the social conflict and Chinese pop culture that was influenced by China’s tremendous development. China changes every day, it’s too fast, and it’s hard to catch up with the changes. The disconnection between myself and Chinese society made me think about the question, is Beijing the one changed or is me? China is a strange land; it’s old and new, westernized but still traditional. Sometimes nothing makes sense in nowadays Chinese society. Looking back; my childhood is the most bizarre dream I’ve ever had. In my work, I deconstruct my inner fears, the impact of Chinese culture, and my adulthood. My subject matter also is inspired by my surroundings as well as daily experiences of my childhood to address the social issues, such as environmental problems, the conflict between poor and rich, and the traditional Chinese lifestyle in modern Chinese society. It’s so real but yet so dreamy; Maybe my childhood is a combination of reality and my fantasy, and I’m a dreamer who dreams in a bizarre world.